Home Events	Smarty Event: Flashes of Hope Give a Mini Session, Get a Mini Session this Sunday at Freedom Park! Smarty Event: Flashes of Hope Give a Mini Session, Get a Mini Session this Sunday at Freedom Park! One of my favorite aspects of my work at CSP is getting connected with amazing people in our community who are doing wonderful things. Flashes of Hope is an example of just that. 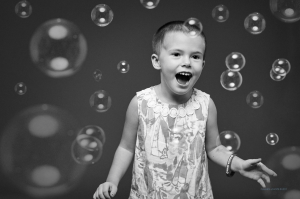 Flashes of Hope Charlotte is a non-profit organization dedicated to creating powerful, uplifting portraits of children fighting cancer and other life-threatening illnesses. It’s an army of professional photographers, make-up artists and hair stylists with a huge heart. We couldn’t be more proud to highlight an event that Smarty Charlotte needs to hear about. It’s this weekend. I’ll let you hear all about it straight from our friends at Flashes of Hope. We certainly hope you’ll be inspired to get involved. Tell us about Flashes of Hope and how you got involved. Each month, we visit the local hospitals where our volunteers, which consist of professional photographers, make-up artists, and hair stylists, provide family photo sessions to these wonderful families. When a child or teenager is diagnosed with cancer, trips to the hospital instantly become the new routine. Isolated from school, siblings and friends, it can be a challenge to find reasons to smile. Yet, children with cancer find a way. Flashes of Hope is honored to be at the hospital to capture those smiles and forever preserve images of courage, beauty and dignity. By focusing on the child, we put cancer in the background. At Flashes of Hope hospital sessions, volunteer stylists make every child feel special before they step in front of the camera with family, friends and often, a favorite nurse. A routine day quickly turns into a celebration of the love that surrounds them. The portraits help the children see themselves in a new light. 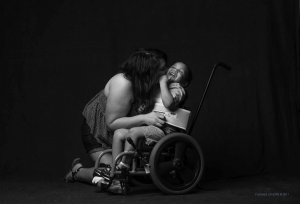 The images are not of sick kids, but of strong and beautiful children filled with hope. I personally got involved with Flashes of Hope Charlotte as a volunteer photographer many years ago and instantly fell in love with the organization. As a photographer, I have always known what family portraits mean to my clients – it’s a way to freeze a moment in time. However, until I started photographing these amazing children, who are literally fighting for their lives, I don’t think I truly understood the magnitude of what capturing these moments in time truly means for them. For many of the families we photograph, these portraits are often the only professional family photos they ever have of their loved ones. It’s such a blessing to be a part of an experience where these kids can forget about their illness – even for just an hour. Share your most inspiring experience with Flashes of Hope? Honestly, there are so many that it’s tough to pick just one to share! However, I do remember a time recently when we were at Levine Children’s Hospital doing our monthly photo shoot. Our stylists and photographers not only make the patients feel special, but they also focus on the other family members as well – especially the moms. I will never forget how grateful this one mom was to just have 15 minutes of pampering. Her child had been in the hospital for months and she said that this was the first time since they had arrived that she had makeup on and hadn’t had her hair in a ponytail. She was absolutely beaming. She kept going on and on about how pretty she felt and how nice it was to forget about everything else for even just a minute. Our photographer captured beautiful photos of that mom and her child that day – ones that they will cherish forever. Nothing can compare to seeing that sweet mom smile like that and be able to forget all of her troubles for a little while. It will always stick with me. Working with Flashes of Hope definitely humbles me and reminds me to appreciate the small, joyful things in life each and every day. How can we get involved with Flashes of Hope? We are always looking for professional photographers to volunteer their time and talents, as well as stylists to help us at photo shoots in the hospitals. In addition, we can also use volunteers to help out at special events with administrative duties like assisting the photographers, signing people up for their sessions, etc. We also need monetary donations to help fund our activities throughout the year. Each Flashes of Hope family is presented with framed enlargements, proofs and digital copies of all of the session images. We provide this portrait package to each family for a donation of $25 – so a little goes a long way! To donate or to volunteer, visit http://flashesofhope.org/chapters/charlotte/directors. Tell us about your upcoming fundraising event, Give a Mini Session, Get a Mini Session. 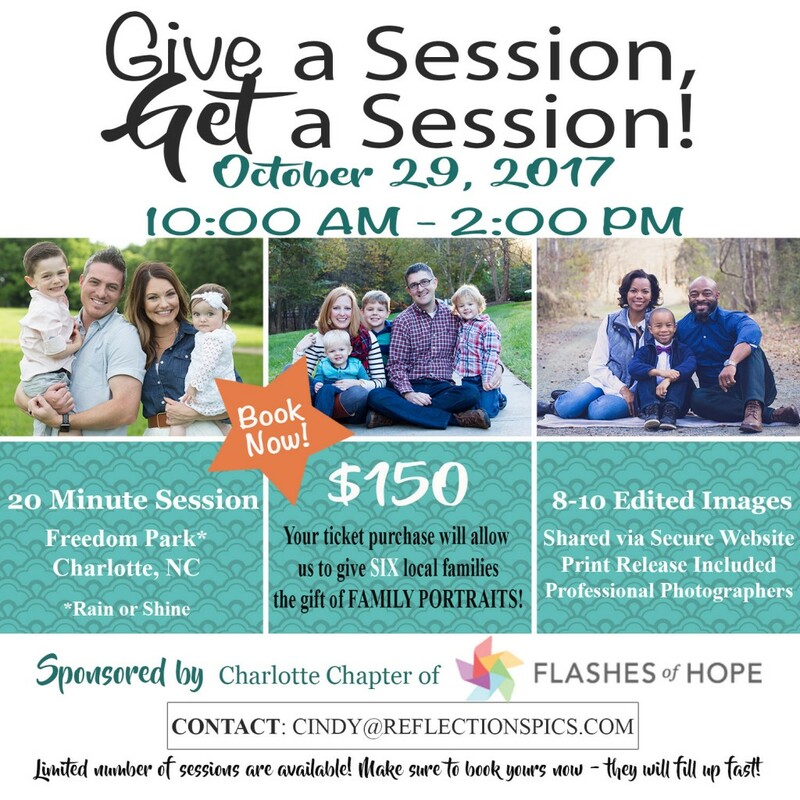 On October 29, from 10:00 a.m.-2:00 p.m., our amazing professional photographers will be holding mini portrait sessions at Freedom Park to benefit Flashes of Hope Charlotte! Each session is $150 and each family will receive all of the digital images from their session, which is virtually unheard of for that price in the professional photography world! We are so lucky to have such wonderful photographers who want to give of their time and talent so that Flashes of Hope can benefit. 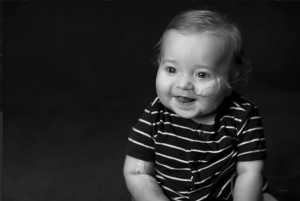 With each family that signs up for a session that day – we will be able to give SIX photo sessions to families who have children in the hospital! If you were thinking about getting family pictures done this fall – this is the way to do it! You will literally Get a Mini Session and you will Give a Mini Session (actually, SIX mini sessions! )!